It almost seems as if many upcoming actresses these days must undergo a rite of passage along their way to true distinction: headlining a subpar horror or thriller that generates few scares and, shortly thereafter, fades into obscurity. Emily Blunt got entangled with lycanthropes in The Wolfman; Jennifer Lawrence intrudes upon the demons of a family's past in House at the End of the Street; Anne Hathaway searched for disappearing survivors of an airplane in Passengers. 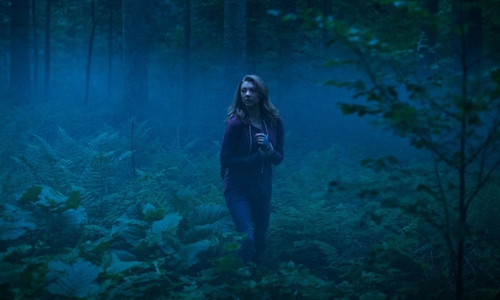 Now, the talented and charismatic Natalie Dormer has tucked some dodgy suspense under her belt with The Forest, a mixture of supernatural enigmas and psychological confusion with the melancholy subject matter involving Japan's historically significant "suicide forest". Even with the dense, misty woods of the location's atmosphere and a dedicated leading lady determinedly stumbling through it, this drama-horror hybrid overextends its subdued tension for the sake of a heroine whose lack of depth obscures the film's bleak mind-games. An American woman, Sara (Natalie Dormer), receives a phone call from the authorities notifying her that her twin sister, Jess, has been presumed dead since she entered and never returned from Japan's Aokigahara Forest, a restricted area near Mount Fuji where people frequently go to commit suicide. Her intuition about the safety of her sister, however, suggests otherwise: that Jess is still alive and could, possibly, need her help. Against the wishes of her fiancee, Rob (Eoin Macken), Sara flies to Japan by herself and gets settled into a hotel near the forest, where her sister stayed. Efforts to find someone to go with her into The Forest are unsuccessful, until she runs into Aiden (Taylor Kinney), an experienced journalist who agrees -- along with a trail guide -- to go with Sara into the woods. With warnings from locals circulating in her head about the haunted and dangerous nature of the forest, she defiantly embarks on her journey to locate her sister, only to discover that those warnings had some credibility. The Forest boasts more than enough elements that could elevate its atmosphere without any trouble: claustrophobic angles accentuating Sara's fish-outta-water place in a foreign country; the superstitions and metaphysics of Japanese culture; and the hazy expanses of the sprawling forests themselves. Despite the controversy over using the Aokigahara for a low-brow production like a horror flick, its storied history does add a real-world downhearted tempo to the search for a troubled twin sister within the area, complimented by the mental effects one could endure -- or think they're enduring -- while traversing such a bleak place. Director Jason Zada transforms the forest into an eerie psychological battleground reminiscent of Silent Hill or The Blair Witch Project, using the despondence of people choosing to die in this place to give it a contemplative edge. These things emerge through lumbering exposition and rigid minor performances, but the film still builds curiosity over what'll appear behind the trees and in the corners of people's minds once they enter the forbidden area. Thing is, Natalie Dormer's primary character, Sara, doesn't offer a particularly remarkable or deep headspace to explore, a dutiful sister whose personality relies on the interesting attributes of other people for hers to appear interesting, even with the tragedy of her past. That might've been allowable had The Forest continued down the path of standard jump-scares, but the script restrains its horror inclinations in service of paranormal drama, attempting to respect the Aokigahara's lineage -- well, as much as they can with dead bodies and visible specters -- and the uncanny bond between twin sisters that tells them whether one's in trouble or not. In fact, Sara's sister could've been a more engaging heroine, a darker girl who digs poetry and relocates to a foreign country for a therapeutic change in surroundings. Sara lacks that personality, no ambitions or interests beyond bailing her sister out of difficult situations, which casts a shadow over the limited dramatic potency. Being a stranger in a strange land under duress becomes her only compelling trait, and that naturally limits the idiosyncratic allure that brought Natalie Dormer's bodice-wearing characters to life. By walking softly along the border between traditional horror and mystical drama, the search for Sara's sister within the historic forest disrupts one's patience with its protracted dullness, extended by a lack of tension and cumbersome attempts at sentiment by Aiden's inquisitive prompts and forthright flirtations. Smooth camerawork follows their hike throughout the forest -- filmed in Serbia as a substitute for the off-limits area -- while anticipating the next dead body or pitched tent of a potential suicide victim, accompanied by obligatory explanations and concerns for what Sara's seeing in the forbidden lands. The Forest does pick up a bit of energy when the line between what's really happening in the Aokigahara blurs with the tricks being played on Sara's mind, driven by dream sequences and ghostly apparitions that confer with the warnings expressed to her before she embarked on her journey. Those effects are mild, though, and would've been far more intriguing had Dormer been reacting to them in the skin of a more complex individual. Despite how The Forest diminishes its tension by virtually announcing the arrival of its few scare tactics -- overlong gaps of silence, suggestive angles, Dormer's widened eyes -- there's still enough paranormal intrigue here driving toward Sara's discovery of her twin sister's fate and the psychological torment she endures along the way. Sadly, those curiosities also become the film's undoing when the boundary separating reality and psychosis completely disappears, where the rules behind how Sara interacts with the Aokigahara's deceptions undercut the real drama surrounding her search, including who she can and cannot trust in her surroundings. Granted, everyone did warn us that bad things happen to the people who enter, but the murky and uncontrollable powers of the area force an ominous supernatural ending onto the search that lacks both weight and overall purpose. Without the scares to fill that dramatic void, all that's left surrounding the spirited talent of Natalie Dormer is a shrug-worthy, tepid stroll of a ghost story, one that'll get buried and fade from memory soon enough.